The details of this story have always bothered me. The lawyer asked, “And who is my neighbor?” seeking, apparently, to learn the bounds of the circle of people he is being told to love. It is possible that the lawyer’s question is indeed seeking validation of how he already is living his life (i.e., “wanting to justify himself”), but this would seem to be an editorial inference, rather than a fact. In the end, of course, this doesn’t matter, at least not to the reader. As the story has come down to us, Jesus does not answer the question as it was posed. After telling his story, Jesus socratically asks, “Which of these three, do you think, was a neighbor to the man who fell into the hands of the robbers?” We have no trouble answering as the lawyer did—the one who helped the robbery victim. 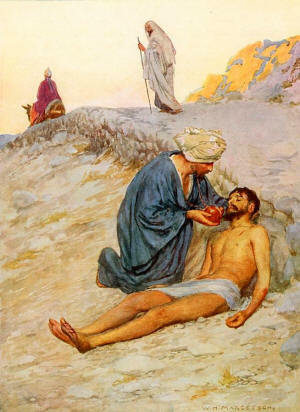 The conclusion of the parable is that the Samaritan is neighbor to the robbery victim, i.e., the Samaritan showed neighborliness to the injured traveler. In light of the question asked, however, we would expect the conclusion that the hapless traveler is the neighbor of the Samaritan and thereby deserving of the love of the Samaritan. The obvious conclusion can be drawn only if one assumes the non-obvious proposition that being a neighbor of is a reflexive relation, i.e., that if a is a neighbor of b, then b is a neighbor of a. But what of the priest and the Levite? The implication is that they were not neighbors of the robbery victim. Is the injured man not their neighbor then? Does someone become one’s neighbor only if one shows compassion first? The presumed message is garbled. Of course, this is not how we usually interpret the parable. Commentary usually focuses on the compassionate passerby. He is a Samaritan, and the object of his ministrations is, presumably, a Jew. Jews and Samaritans do not normally associate with or respect one another. That the person in need is an “other” sends the message that neighborliness is not to be confined to one’s family, friends, associates, or nearby strangers. One’s neighbor can be anybody. Jesus should have asked—the story should have him asking, at any rate—who showed love for his neighbor? The answer would be the same, but the story would be more coherent.